Have you seen the new Strawberry Fusion Tic Tacs in stores yet? They are pretty in pink and have a deliciously sweet flavour! 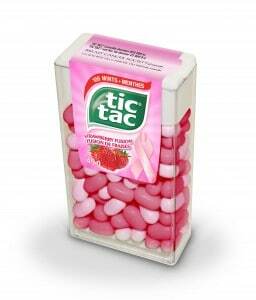 Tic Tac Canada has introduced this limited edition flavour in support of Breast Cancer Awareness month in October. They have donated $25,000 to the Breast Cancer Society of Canada, an organization dedicated to funding Canadian breast cancer research for the detection, prevention and treatment of this disease that affects so many Canadian women. Their goal is to ultimately find a cure for this disease. I know a few people including some family members who have had breast cancer. Some of them have beaten it and others were not so lucky. It’s an important cause that is close to my heart. I encourage you to pick up the new Strawberry Fusion Tic Tacs the next time you are at the store. Plus for the months of September and October, you can visit the Tic Tac Canada Facebook page for the latest news and promotions about this worthy cause. Weird, I haven’t seen these in our local stores at all. I definitely need to go on a hunt for these. Thanks for sharing. What a great way to spread awareness! They also sound delicious so I’ll be keeping my eyes open for them. What a great idea! I can’t wait to try these. Hope they come into my area soon. We need more companies like this that help earn money for research of this disease! Last year my aunt participated in the Susan G. Komen walk on her 7oth birthday AND as a 25 year survivor of breast cancer!!! What a great idea! I will look for these tic tacs in my grocery store. They look delish!